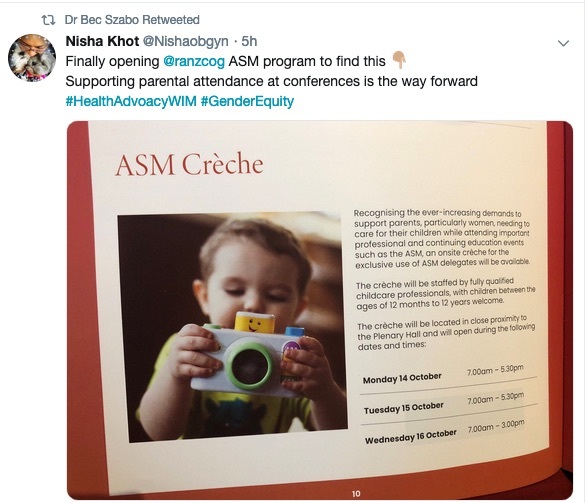 Home Croakey Conference News Service #HealthAdvocacyWIM What’s next to address gender inequity in health and medical leadership? Quotas? 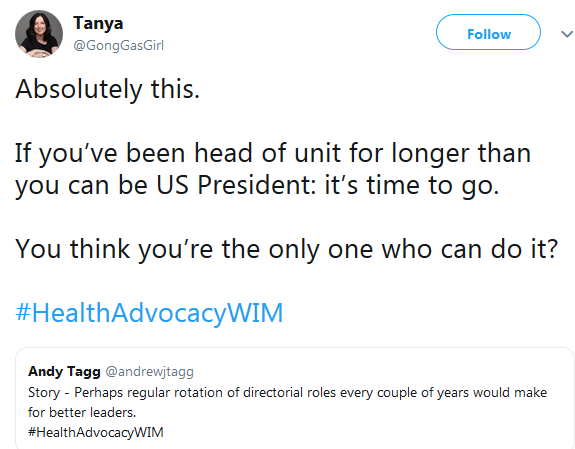 The stark gender gap in leadership positions in health and medicine has been on the agenda in Australia at big medical and health events in recent days, including via Twitter on #amaequity and #healthadvocacyWIM. Marie McInerney reports below for the Croakey Conference News Service on one of those events, a special Women in Medicine grand round panel event at the Royal Women’s Hospital in Melbourne last Friday. Male dominated medical colleges and other health organisations and services are under increasing pressure to take structural action to address the acute gender gap in their leadership positions, including by introducing female quotas for boards. 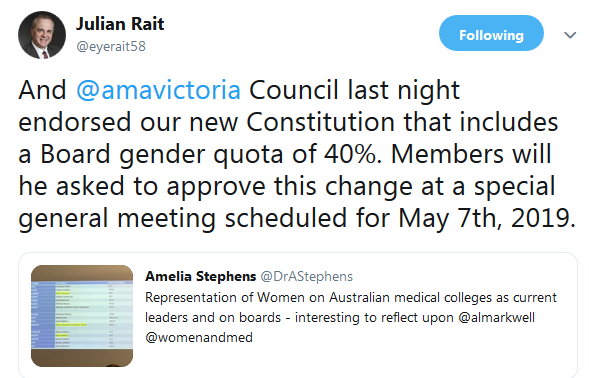 The executive of the Victorian branch of the Australian Medical Association last week took the lead, endorsing a new Constitution to go to a special vote by members on May 7 that includes a Board gender quota of 40 per cent women – reflecting its membership numbers. News of the development came as the Royal Women’s Hospital in Melbourne hosted a special grand round panel discussion on Women in Medicine to discuss ways to address gender inequity in health and medical disciplines in Australia. The event, on 22 March, highlighted gender gaps in critical leadership roles, including at medical colleges like the Australasian College for Emergency Medicine which currently has no women on its board. Panellists also called for hospital department heads to be rotated after two or three years to put an end, as anaesthetist Professor David Story put it, to a “particularly blokey tradition”. “They act like kings and they stay like kings for 20 years,” said Story, the Foundation Chair of Anaesthesia at the University of Melbourne and Head of the Anaesthesia, Perioperative and Pain Medicine Unit. Fellow panellist Dr Neela Janakiramanan, a plastic and reconstructive surgeon, backed the call, telling the 200-strong audience that at one public hospital in Melbourne there are “more heads of units called Peter than women”, while women make up only 10 per cent of heads of departments across Melbourne hospitals. She urged Health Ministers and other political leaders to act on the “incontrovertible evidence” that diverse workforces deliver economic and social benefits. “Why are we not conditioning the funding of our public institutions on having diversity in the leadership groups?” she asked. 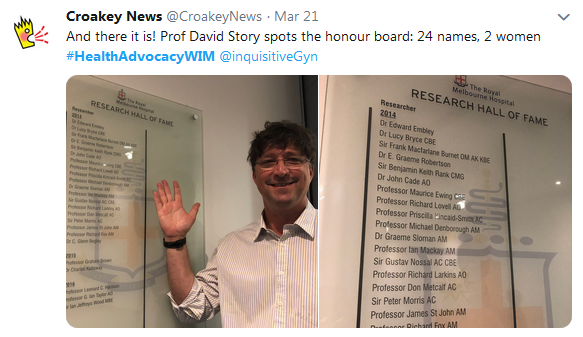 AMA Victoria president Associate Professor Julian Rait told Croakey at the event that the branch’s move came out of concern at the “widespread disadvantage” experienced by women in medicine, particularly those seeking leadership positions and research grants. He called on other health organisations to make a similar stand, saying that targets – the approach taken by other state AMAs and other organisations – remain aspirational rather providing than the structural change that a quota brings. “We think these sorts of structural changes are necessary not just for our own board but also across the health sector,” he said. 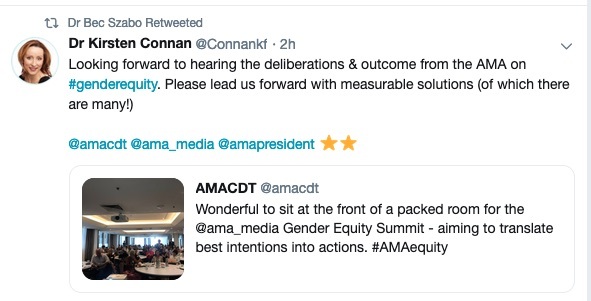 The AMA’s Gender Equity Summit on Saturday also saw medical colleges named and shamed for their leadership gender ratios. ACEM president Dr Simon Judkins, who was also a panellist at the Women in Medicine event, said the College was trying to address the “unacceptable” lack of women in its leadership ranks, though was stopping short of quotas for now. 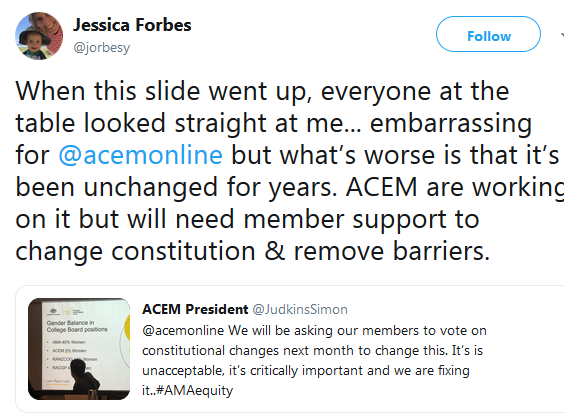 He told Croakey he expected members to approve proposed changes to the ACEM constitution in coming weeks that aim to have women make up 40 per cent of the board, from the current zero representation, by 2020. “The next step will be reviewing. If it’s working, great; if not, then we’ll look at quotas,” he said. Dr Kirsten Connan, an obstetrician and gynaecologist who was also on the panel, has been calling on her college, the Royal Australian and New Zealand College of Obstetricians and Gynaecologists (RANZCOG), to adopt quotas for its board after her survey of trainees and fellows as part of her Masters last year showed the leadership “pipeline” is not working. The Women in Medicine event was staged to tap into conversations prompted by the global #MeToo and #TimesUp movements for gender equity and to end sexual harassment and sexual abuse in workplaces. Its panel included leading US gender equity advocate Dr Dara Kass, who founded FeminEM, for women working in emergency medicine, and was one of the founding members of the TimesUp Healthcare movement launched in the US earlier this month. (Croakey will publish a separate story about her work soon). 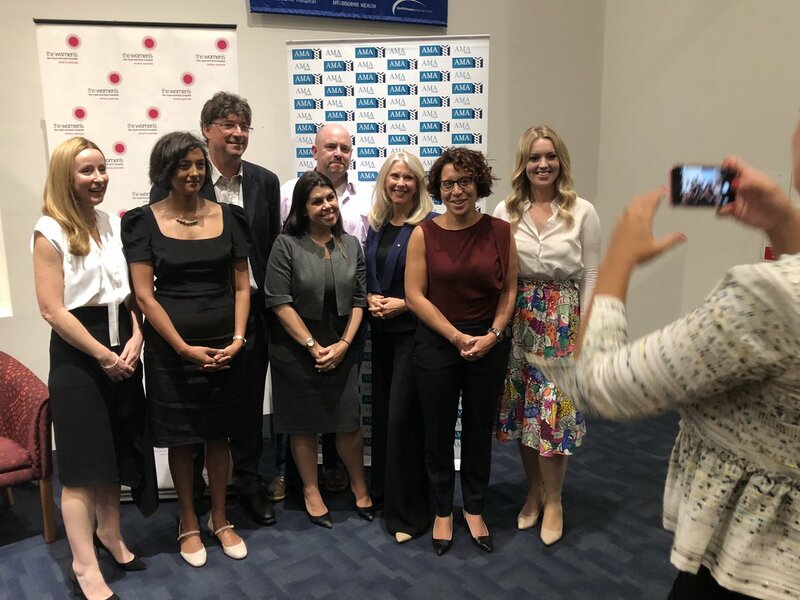 Moderated by journalist and author Tracey Spicer, who has spearheaded the #MeToo movement in Australia, the 90-minute grand round was livestreamed by RANZCOG, where it has had more than 1,000 views so far. 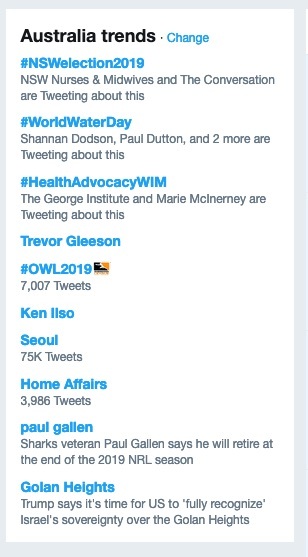 The event’s hashtag #healthadvocacyWIM trended nationally on Twitter through the day, and so far has generated nearly eight million Twitter impressions (read the full Twitter transcript here). Coordinator Dr Rebecca Szabo, a gynaeocologist and medical educator at the Royal Women’s, said the packed audience, which flowed over into another room, proved there was also a thirst for such discussions beyond those already engaged on social media. “It was really quite powerful for me to see that in real life,” she said. Below are some of the takeaways from the wide-ranging discussion. Kass, an emergency medicine physician, told the event it was important to frame gender equity in health in terms of its wider impact – not just as a women’s issue and not relegated to ‘wellbeing’ policies – because the evidence is clear that a more diverse and supportive workforce in medicine is better for patient outcomes. Unfortunately, she said, gender equity in health becomes a “women’s burden” because it is about privilege – “when something is inequitable, the person who is affected the most gets left to solve the problem”. “It’s life saving, it’s patient saving, it’s career saving,” she said. “The idea that we don’t solve this is crazy because it makes sense for us as physicians, for our patients, (and) for our employers, because who wants to train a workforce and have half of it leave because they’re disengaged or disenfranchised,” she said. 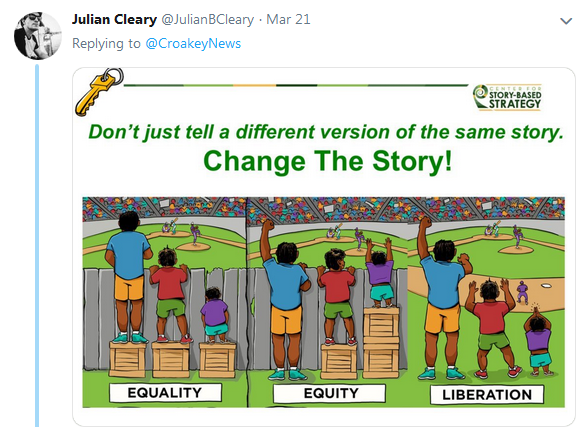 Both Kass and Dr Neela Janakiramanan talked about the difference between gender equality and gender equity, in the context of the often-used graphic illustration (see tweets below) showing three children trying to get a view into a sport stadium. 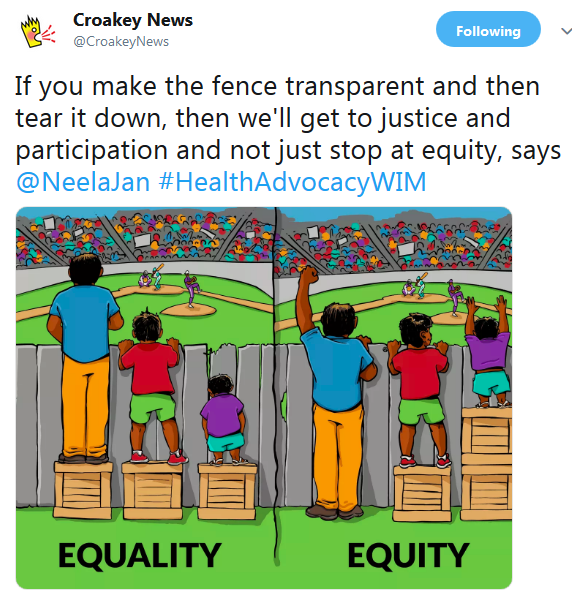 Janakiramanan, who played a leading role in a recent campaign to recruit doctors to support efforts to get asylum seeker children and families off Nauru, urged the health sector and wider community to look beyond equity and to try to make the fence in the graphic see through or to tear it down altogether. “This is what we need to get to eventually, to get to justice and participation and not just equity,” she said. Janakiramanan later told Croakey that discussions about gender equity need also to look at equity issues for other health professionals who make up smaller minorities than women, including those who face discrimination because they are foreign trained, have disabilities, or are lesbian, gay, bisexual, transgender, intersex, and questioning (LGBTIQ). Janakiramanan also urged people to understand the structural issues behind implicit bias so that they didn’t see it judged as a personal moral failing and therefore become defensive. Seeing implicit bias as a personal rather than structural failing was part of the reason, she said, that some people, particularly men, struggle to address it. The panel also talked about the importance of implicit bias and gender stereotyping in understanding and addressing the gender pay gap in health and medicine, particularly in the US where Kass said patient satisfaction surveys, “which are highly influenced by bias”, affect how much doctors there are paid. Given pay rates for men and women in medical roles are the same, panellists said advocates for equity have to look at ‘why’ the pay gap is there. It includes the obvious interruptions to the career path that many women have because of children and carer responsibilities, the event heard. But there are also less obvious reasons, such as that women clinicians might get more referrals to complex social and emotional patients (“because the nurse thinks I’m better at it”), because female GPs may take longer with consultations, or hospitals may resist overtime payments more for women. The event heard that women clinicians also leave or avoid some higher paid specialties, such as surgery, because they are “toxic cultures”. Surgery in Australia has been under fire particularly in recent years amid widespread and shocking complaints of bullying, sexual discrimination and assault. Research by Gold Coast Health breast surgeon Dr Rhea Liang on why women leave surgical training was published in last month’s special edition of The Lancet on women in medicine, findings that moderator Tracey Spicer said were also relevant to the media industry. Liang’s team confirmed the impact of bullying and harassment but added other factors that were not issues only for women including: lack of leave, absence of professional supports, fear of repercussion, long work hours and fatigue, and constant relocation. Janakiramanan said the spotlight on her speciality was deserved but should not excuse other areas of medicine from looking at their cultures, where often “a particular type of masculinity” is valorised that also excludes men who do not fit the stereotype role. Different issues for rural and regional medicos? Dr Skye Kinder, a first-year psychiatric trainee at St Vincent’s Melbourne who grew up in regional Victoria, talked about the different issues that affect the pathway to medicine for people from lower socioeconomic backgrounds and rural, regional and remote areas. She urged more support, including scholarships – “education is the great equaliser” – to help them and others, including Aboriginal and Torres Strait Islander people, to move to cities to study so they can build a more inclusive health workforce. “Medicine is often not a safe space for minorities and marginalised people because we often don’t have that representation in our profession to really understand the issues those people experience,” she told Croakey. That means that many patients may stop seeking care, she said. But while women from rural and regional areas often find it more difficult to get into medicine, Kinder told the event there may be more opportunities in leadership for women in rural and regional health settings because they are “chronically under-resourced” and therefore more used to being creative, flexible and inclusive. She pointed to strong female leadership in the Rural Doctors Association of Australia, and in the Victoria branch, as well as in regional hospitals where she trained. “I think I’ve had a great opportunity to see female role models”. While many gender inequity issues require complex, structural solutions, Connan said there are also some really simple ones that can have a big impact. They include putting in breastfeeding rooms in hospitals and mentoring programs that move away from allocating one mentor “for life” and instead recognise the need for support on different issues, including sexual harassment, career planning, and work/family balance. Being “really intentional” about flexibility in the workplace and medical schools, particularly with part-time training and parental leave opportunities, was another big area, she said. Marie McInerney is covering #HealthAdvocacyWIM for the Croakey Conference News Service. Bookmark this link to follow the coverage.